Illustration of an out-of-work Johnny Manziel done for Lindy's 2016 NFL Preview magazine. Opening pages illustration for Lindy's 2015 NCAA Football Preview magazine. I illustrated this team poster of the 2014 Atlanta Braves. I did it primarily as a giveaway for 3 of my luckier Twitter followers. Several years ago I was asked by an Atlanta Falcons fan-started charity to do an illustration of former starting quarterback Steve Bartkowski. 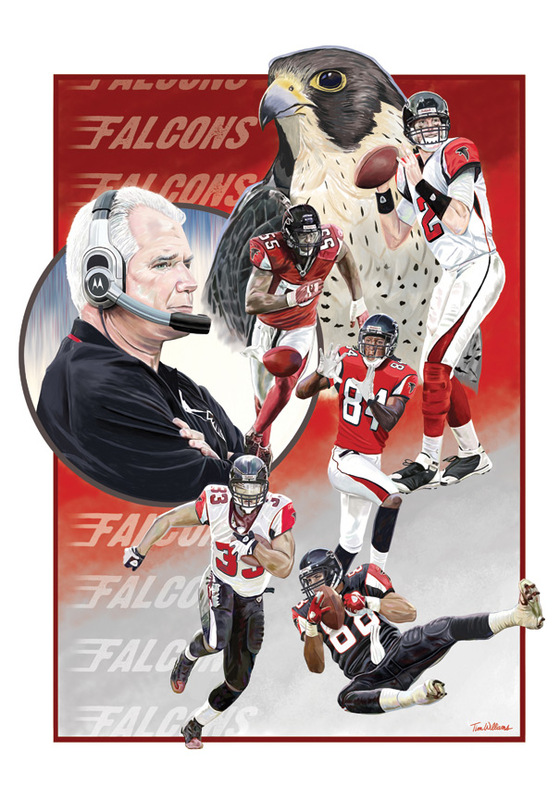 A few years ago when the Atlanta Falcons hired a new GM, new coach and drafted a new starting quarterback I decided to do a team poster. Writer Mike Shannon put together a book a few years ago celebrating Willie Mays and his 75th birthday, Willie Mays-Art in the Outfield. This was mine and appeared in the book. For many years now I have been the primary illustrator for Lindy's Sports Magazines. This illustration was done after LeBron James left the Cleveland Cavaliers to join the Miami Heat. I did this painting of Jordan when he was at the pinnacle of his fame. That is Jordan's signature on the piece. This illustration was also done for Lindy's NBA Sports Preview Magazine. There was a famous incident where LeBron got dunked on by a college kid. This is a promotional illustration I did of Matt Ryan. Towards the end of his NBA career Shaquille O'Neal hosted a television show where he tried to help obese kids lose weight.